No clue-brain dead right now. Thread: No clue-brain dead right now. If I want the flying geese of a block to finish at 7 1/2 by 2 1/4, what size do I cut the fabrics for them? Flying geese are always twice as long as they are high. That's the finished dimensions. You could make a block with your dimensions, but it wouldn't technically be a flying geese block, and the various methods for making flying geese wouldn't work. Is there a technical name for a three piece unit made of three triangles that has 'other' ratios? One of the famous quilters made a fantastic mariner's compass with those units making a circle around the center. I am fairly sure that they were wider on one end than the other. I've also seem quilts where the three piece units undulate across the item. Last edited by Rose Marie; 08-17-2013 at 07:56 AM. I asked for help a few times regarding the making of these blocks. I appreciate ALL the information I received. This is what I finally did. I used up most of a panel to get these done. I only needed four of them. My son was in the Air Force and then worked at Cape Canaveral. I bought the panel one time I visited him in Florida. Thanks again for all the help. 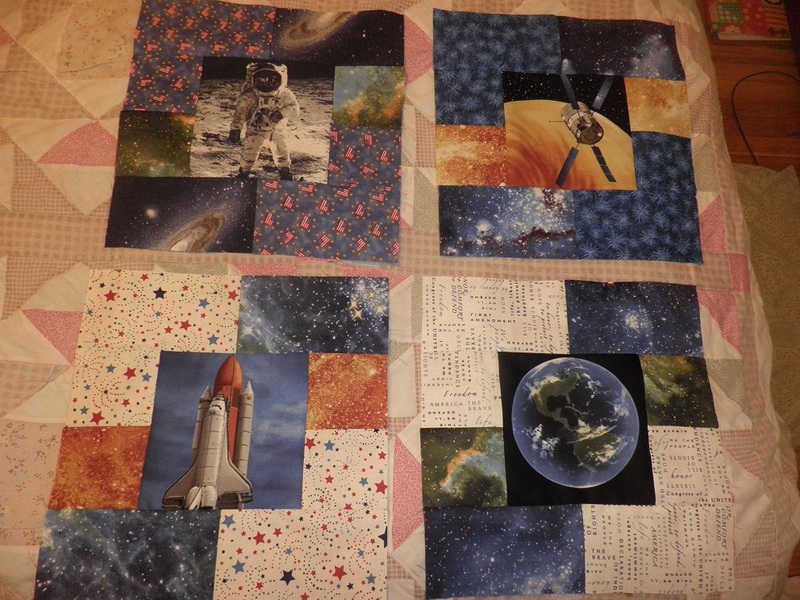 Hopefully I can get the whole quilt finished soon and show you the finished project.